Data suggests that if an individual reaches 65 years of age, it is likely this individual will live until 85. Miami-Dade County has the largest number of older adult residents in Florida (nearly half a million are age 60+), and that number is expected to double in the next 25 years. How well Miami-Dade responds to the aging phenomenon will depend on how well we prepare our communities to do so. 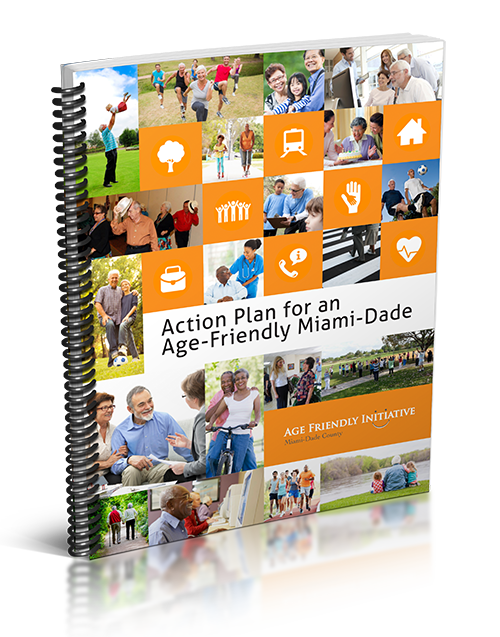 The Miami-Dade Age-Friendly Initiative is now launching its Action Plan for an Age-Friendly Miami-Dade. The overarching goal of this plan and for the Initiative is to Create a community for all ages, where older adults in Miami-Dade can stay active and healthy with dignity and enjoyment. This Action Plan was developed using a results-based accountability framework to guide the collaboration among the Miami-Dade Age-Friendly Initiative partner organizations, which include the AARP Florida, Alliance for Aging, Miami-Dade County, Health Foundation of South Florida, United Way of Miami-Dade and Urban Health Partnerships, in a step-by-step decision-making process towards reaching a Collective Impact. Establishing an organizational or municipal task force to review the action plan, prioritize specific areas, and develop a process to move forward. We hope you’ll review this Action Plan and help us meet the needs of this very important segment of our community.